Discover our lineup of legends. 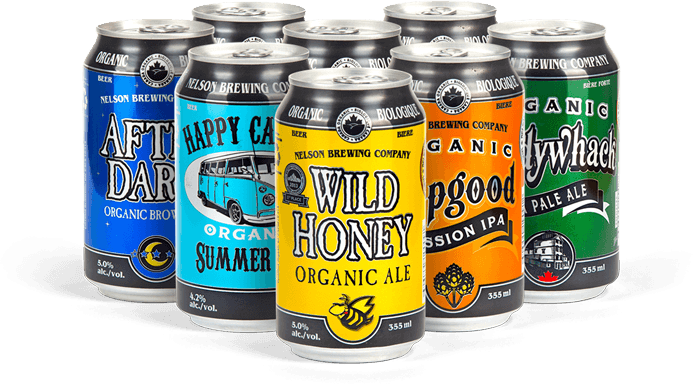 Nelson Brewing Company is a Certified Organic craft brewery located in the cultural and recreational heart of the West Kootenay region. Situated in Nelson’s original 125 year old brewery building, Nelson Brewing Company is committed to producing natural, hand-crafted, traditionally styled beers. Explore new beers rotated regularly – fresh on tap. Our brewery’s tasting room is your chance to relax, sample our limited edition creations, meet the people behind the product, and pick up some NBC branded merchandise in an inviting and friendly environment. Learn more about the rich history NBC has experienced, and the values we hold to our work ethic. We’ve come a long way, come take a walk down memory lane.